I found out about Air Fortress earlier this year when I was looking through a list of games made by HAL Laboratory, the developer responsible for Kirby and Super Smash Bros.. It turns out they've been around a lot longer than I thought: since 1980. I tried out Air Fortress along with a few other games and decided that this would be a good one to get and review in greater detail. The game itself can be explained pretty simply. 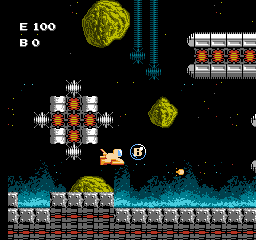 Each level is divided into two parts: a traditional space shooter part and an on foot part. During the space segment, you ride on (not in) a spaceship and approach the air fortress, which really is a space fortress. While doing so, you must shoot enemies and dodge obstacles, like the giant turd-shaped asteroids that appear to be in the background but aren't. But more importantly, you collect bubbles of E and B which will prepare you for the second segment. One's first assumption might be that E stands for Energy and B stands for Bombs, but there's nothing that confirms this. I first assumed that the E stood for Earwax, but later I realized that E and B could only possibly stand for Eggs and Bacon. Once inside the fortress, you're on foot, armed with a gun, your collected bacon, and a jetpack that runs on eggs. The goal here is to find and destroy the Eye of Sauron which powers the space station, then find the exit before the fortress explodes with you in it. 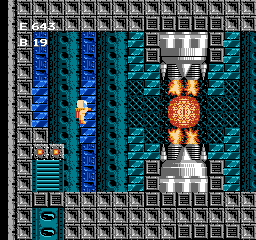 Of course there are enemies to worry about too and as the levels go on, the air fortresses become more and more mazelike. Navigating with the jetpack is pretty cool, and when you shoot it kicks you back realistically. Any movement or shooting decreases your eggs, but standing still makes them quickly recharge. If you get hit by an enemy your maximum number eggs decreases, and if you run out of eggs, you die. The bacon acts as a limited use explosive shot, which explains why so many mistakenly believe that the B stands for bomb. Every level works pretty much the same way and rapidly gets harder until, when you get to level 5 or 6, it's nearly impossible. I don't see how you'd ever be able to finish them all, but there 8 levels and then second quest versions of each level. Thankfully, there is a password system in this game so you don't have to do it all in one go. Seriously, some of these levels all but require you to map them out so you don't waste all your eggs wandering around and so that you can actually escape when you get to that point. The music is pretty much the same throughout and has just two main tracks, one for each section, so by the third or fourth level you'll have them hopelessly stuck in your head. The graphics are pretty old looking, but not bad. They don't vary much by level though. The most impressive part comes when you destroy an air fortress's core (Sauron), which makes the lights flicker, the music go creepy, and the screen gradually start to shake as you dash to the exit. It's scary and panic inducing as there is no countdown clock to your destruction besides judging from the amount of shaking and noise.